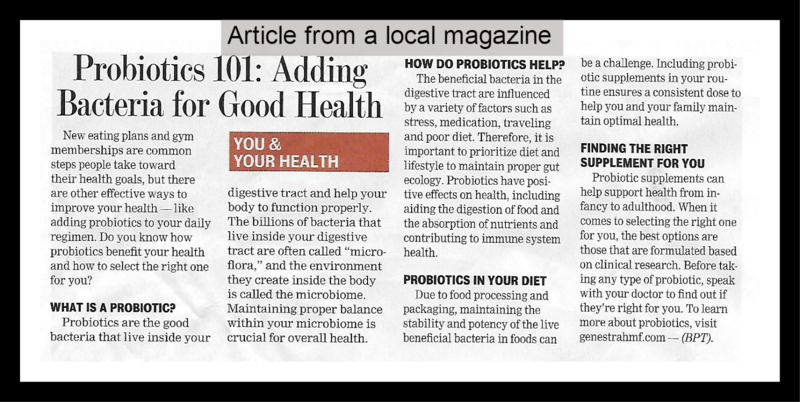 Probiotics are great for overall health! I received samples from Genuine Health to facilitate this post. I have known for a long time the benefits of probiotics, way before they became popular. It started with me enjoying yogurt when I was a young adult and I learned about buying the yogurt with live cultures. When my kids were little, I would always give them yogurt whenever they had antibiotics as I knew it would help their stomach. I just knew that the live cultures were good for us but I really didn't know the much more than that. My husband used to make fun of the live cultures in yogurt as he did not like yogurt. Fast forward to the year 2015 and I learned so much more about probiotics beyond eating yogurt. I learned that for good health that taking a probiotic supplement could do so much more than a cup of yogurt. I started taking a probiotic supplement and was amazed at how it helped my gut become regular. I then started my boys on a daily probiotic and gone were the weekly " my stomach hurts" complaints. I even noticed that my boys got fewer colds and when they did get sick, they recovered much faster. I even got the teen to try probiotics for his acne. I learned that probiotics are the good bacteria that help your gut become healthy and that a healthy gut leads to overall health throughout the body. I was singing the praises of probiotics to anyone who would listen to me but people seemed hesitant in trying them. I was thrilled when my daughter became pregnant and made healthy eating a priority. It is amazing how caring for another person can make you start to eat healthily and be concerned about what you put into your body. My heart skipped a beat when she was searching up mercury contents of fish when we were at a restaurant. So I took this opportunity and sent her a box of healthy goodies that included probiotics by her request. Here in Albuquerque, the joke is that we are 20 years behind the rest of the world. 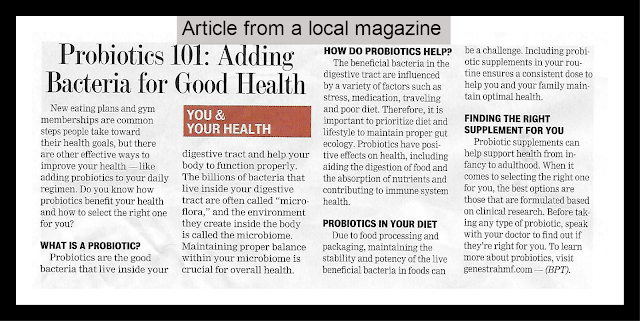 When I saw this article last month in a local magazine, I was amazed that even the benefits of probiotics are known here. While this above article has great info, the last part of "check with your doctor to see if probiotics are right for you" leaves me puzzled as if you have a stomach, then probiotics are great for you! 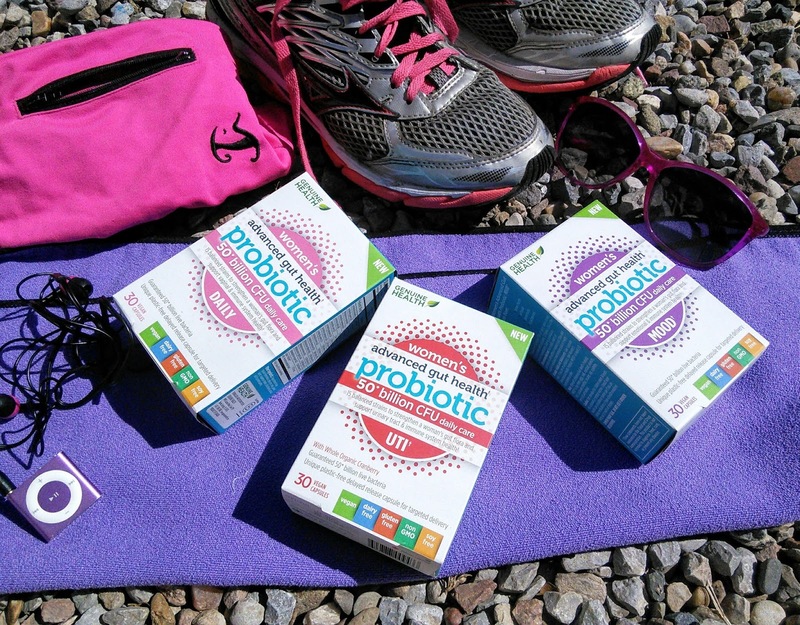 Did you know that there are many different strains of bacteria in probiotics? Women are different in many ways from men so it makes perfect sense to me to take a probiotic that is made for us ladies. Genuine Health's Women's Advance gut health probiotic is crafted with 15 strains in a balanced formula to promote women’s gut, skin, vaginal health and immune health. Want to know more about Genuine Health's Women's Advance gut health probiotic? I am giving away a set of three Genuine Health's Women's Advance gut health probiotics to one lucky reader so they too can experience the awesome benefits of probiotics. Just head on over to https://us.genuinehealth.com/ and tell me which probiotic or other product you would like to try. Then come back and enter on the giveaway form below. This giveaway is open to US residents 18 years of age or older. Chances of winning this giveaway depend on the number of entries. All entries will be verified. The winner will be notified within 48 hours of the end of the contest and will then have 24 hours to respond to the email or a new winner will be chosen. Void where prohibited. I learned that you only need to take 2 capsules a day and they are easy to swallow. these probiotics contain 15 different strains of beneficial bacteria. I love that this starts working in 5 days! I learned that this is made with fermented tumeric. I love that joint cartilidge is rebuilt! I learned it starts working in 5 days! I learned that it helps build joint cartilage. I learned that this product contains BiovaFlex natural eggshell membrane. I learned that it works in as little as five days in taking 2 easy-to-swallow capsules. It also benefits joint health and immunity in addition to overall digestion. they have a joint relief supplement with tumeric. your immune system benefits from ingesting healthy bacteria. Those taking BiovaFlex® are 5x more likely to experience a 50% reduction in discomfort versus glucosamine, 3 x more likely to experience a 50% reduction in discomfort versus a leading Rx drug for joint discomfort. I learned that it contains transforming growth factor! Vaginal, gut and immune health, all in one, yes please. Balance of all three of those things remain a struggle for me as I get older. These probiotics capsules are easy to swallow 2 pills daily which contain 15 different strains of beneficial bacteria. It helps build joint cartilage! I learned that you can get fast relief from joint discomfort in as little as 5 days. I like that you can chose the right one for you. They offer a lot of different kinds for your needs. I learned that helps build joint cartilage, while improving long-term joint health. I learned that is formulated to help a woman vaginal health. Exercise boosts energy. Regular physical activity can improve your muscle strength and boost your endurance. Exercise delivers oxygen and nutrients to your tissues and helps your cardiovascular system work more efficiently. And when your heart and lung health improve, you have more energy to tackle daily chores. And after my exercises I like to have the best hgh supplement for a stronger and fitter body. I would like to recommend it to every individual as it's natural and does not cause any harm to the body. It's a must try!!! In line with the maker, PhenQ achieves this by focusing on excess fat in A few different methods: losing extra fat, controlling your appetite, preventing fat production, and increasing mood and so energy. And now learn more about Phenq. Basiclifesupport.net/ website -- Eating plan, workout, and nutrition source that may help you live a proper long life. Subscribe to our weight loss plan opinions, rate and sign up.